Unlike Ibeshe, Ilashe and Makoko riverine in Lagos, Irede community is rather clean and almost spotless with white sands on dry ground. It has very beautiful mansions, too like in urban areas. It is a journey of 10 minutes drive by wobbling boat on murky water. It accommodates about 3,000 dwellers. And it comprises three communities including: Irede, Ikaree and Iyeghe. Sited at Abule-Osun area of Lagos-Badagry expressway, Irede had a broken dispensary since 1979/ 1980 during the administration of Lateef Jakande. Till date, it is uncompleted and deserted save reptiles and human waste; hence, no functioning PHC to provide health services to pregnant women and nursing mothers with antenatal care, delivery, postnatal and family planning. This way, the women won’t risk their lives. Undoubtedly, Irede is faced with numerous health challenges. There is no primary health centre or health workers. So,pregnant women and nursing mothers patronise iya-Alagbo or Traditional Birth Attendants and home-delivery for antenatal care and delivery. One of such women is Fatima Saliu, whose baby is six months old now. She said she had her first and second children with the presence of an auxiliary nurse at Ojo area near her mother’s residence while she had her third and fourth babies at home. When asked if she ever went for antenatal, Fatima expressed sadly that her husband wouldn’t give her money for it. “Sincerely, I didn’t. I went for antenatal during my first pregnancy only. The reason is that ever since I had a little problem with my husband he stopped giving me money for antenatal care. That’s why I didn’t look at that side. It is only God that is helping me”. Now, despite her preference for home delivery, the mother of four has taken her baby for immunisation. 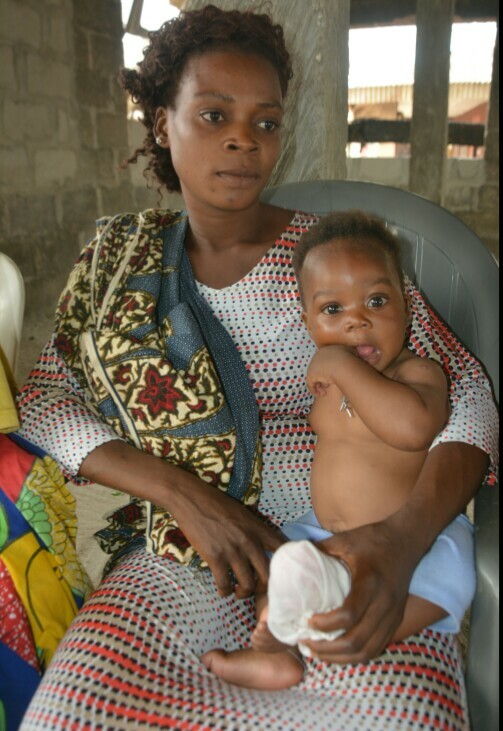 “I only take him to hospital for immunisation whenever I went to Ojo, my mother’s place. But sometimes health volunteers come here to immunise babies". Sadly, she reminisced about an ugly experience after the health workers visited and immunised her third baby. “That day, after she injected my baby’s arm, it became swollen. Today, still coping without a health facility, an expectant mother, Abike Ahmed – who is six months gone – combines both orthodox and traditional methods simultaneously. “There is no hospital here at Irede. Hence, I registered at Ojo hospital. But I go to one mama place. She gives me agbo to drink for my baby”, she said. When asked what she would do if she fell into labour at night, her reaction was rather uncertain. “I don’t pray it starts at night. Since I had my first two children during the day, I pray it happens in the day so I will use a hospital”. Unfortunately, 27 years old Kate Felomo, a mother of two – including three years and a nine month old – is not among the 65 per cent of pregnant women between 15 and 49 years old that had access to antenatal care with the present of skilled birth attendant as recommended by the United Nations Children's Fund (UNICEF). From her words: “I have never had antenatal care before. I just wait until the ninth month then i give birth. But I delivered my second child at a hospital across the water within an hour." She is not alone in this. 30 years old Isa Nofisat, who is six months pregnant with her third child, told THISDAY she had her babies across the water. Interestingly, Nofisat has an excellent way of spacing her babies. Although she knows nothing about family planning, her perfect method will startle you. “I don't know family planning. But since my home town is Kogi, I go there to stay for a very long time after child birth. That is how I space my babies who are aged five and three years old”, she giggled. But for the impromptu delivery at the church, Opeyemi entrusts her pregnancy with a TBA, where she gets agbo (local medicine). She added: "I registered at Iya Alagbo (TBA) where I had antenatal. The Agbo woman takes 100 naira only for test. When you go to register, you pay about 3500 naira for registration, card and everything." These women had safe deliveries in the end notwithstanding, they missed out on the many benefits of antenatal care: revealing and understanding warning signs during pregnancy and childbirth, prevent eclampsia, HIV testing and helps women with drugs and insecticides treated nets among others. Despite recommendations UNICEF give, that antenatal care and skilled health attendance at delivery are essential for eliminating every preventable maternal death, Irede women either eschew antenatal or use TBAs, who can neither diagnose for HIV or danger signs during pregnancy. Following this, former Chairman, Amuwo Odofin Local Government Area (1999 to 2002) and former chairman Ori Ade LCDA, Mr. Saliu Sekoni, said he used to send manpower to man the place. Accordingly, he added that during the tenure of his successor, Tunde Sanusi, there were plans to upgrade the dispensary centre to a PHC. So, the dispensary was demolished and this structure began. Truly, the PHC, which is meant to serve Irede and Ikaare if completed, will come really handy for the residents. “Right now there is no PHC that pregnant women access except Ibeshe which is 10 minutes boat ride from here”. Lending out her voice for her people, daughter of the late Oba, Asisat Adebisi Lawal says dwellers of Irede do not know their health statuses till date. She blamed the “fake” doctor that always checked on and gave the deceased medications. “Her blood pressure was 240/180. By the time she was about to give up she was paralysed and in less than few hours, she died. And there are a lot of people in this environment going about with HBP but don’t know”. Malaria seems to be the commonest illness here among the children. Adding, the audacious Princess of the land, Asisat, said there isn’t much mosquitoes at Irede. "We have season for every insect and this water controls a lot of insects. When the water is really full, there are no insects. But when it is dry, the insects can have their way at night”. Asisat, who spoke bluntly, described Irede people as sluggish in caring for their health. She says it is better for them to know their statuses. But, Asisat, who chorused same problem, added toilet facility and PHC to the list. “I believe toilet is a need. Most of the houses don’t have. "They prefer to go to the sea-side and do that. At mid night, they use bucket inside their room," adding, she said, "We also need PHC for our pregnant women," she decried. With these, therefore, residents including pregnant women and nursing mothers plead for express completion of the PHC and equip it with drugs. "This will really help us. 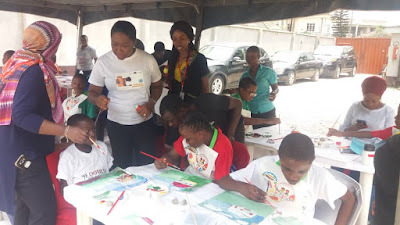 It will save our women from dangerously crossing the river and struggling to get to PHC in Ojo just to experience the joys of motherhood," Asisat pleaded.